Turn up and join our monthly Chapter meeting on 19th May 2010. Mark your calender now. It will be a night of fun, laughter and building confidence when you learn and unlearn. If you are arriving for the first time, please email us at sp@toastmasters.sg, more info will be send to you before your arrival. Thanks. Come and join our monthly Chapter meeting on 21st Apr 2010. Mark your calender now. It will be a night of fun, laughter and building confidence when you learn and unlearn. IMPOSSIBLE…….. the word describing the change in me. To many people who knew me for more than ten years, they would say I was a very shy, timid and reserved person. When I was young, I would blush whenever I converse with people, especially with girls. There was a period of time when I realized that I should not continue my life in this manner. I plunged myself into a sales career where I felt it was the best training ground to force myself to change. I begun to open up myself slowly knowing training can help me progress myself in my career. I further continue to participate in more sales and motivation courses. 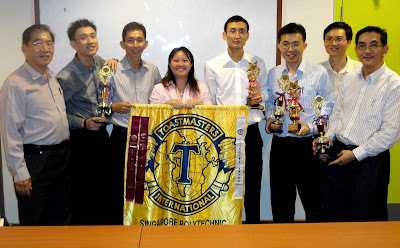 In the year 2005, I found one of the most enriching and enjoyable training avenue known as Toastmasters International organized by the Singapore Polytechnic Toastmasters Club (SPTMC). By learning the guided steps of public speaking, I began to realise that it is definitely POSSIBLE to train oneself to be a confident public speaker eventually. As my confident increases with the training I received with SPTMC, I even participated in our club contests and in return, I won many trophies which have now became my prize collection. Above all, learning public speaking with SPTMC helps me to improve not only my communication skills but also my listening skills. Today, I am a more confident person and have no fear communicating with anyone around me. At my own freewill, I even volunteered to be part of our club’s executive committee where it gives me a platform to learn to work as a team, at the same time to become a better leader. To me, Toastmasters movement is a complete self-improvement training ground where we share and learn to build our self esteem at our own pace. No one in this world is impeccable but anyone in this world is changeable. Taking myself as an example, who was shy, timid and reserved 4 years ago, I felt I have been transformed to a new person that is confident and positive. My thanks to SPTMC. For all of you out there, simply take the first step to join SPTMC and you will be transformed from “I-M-P-O-S-S-I-B-L-E” to “I’m possible”. Congratulations to all winners. Frederick Kok and Roger Ong will represent our club in the Area Contest which will be held on 3 Apr 2010 (Sat). Please give your support by attending the event. The club also wish to congratulate all audacious contestants who had taken part in the contest. We have learn from one another and we hope to see more contestants in our up-coming events and contests. Last but not lease, the club will like to specially thanks our chief judge and the panel of judges for supporting and spending their valuable time during the event. We also thank the organising chair and all appointment holders during the evening.